Friendship Heights is a residential neighborhood in northwest Washington, D.C. and southern Montgomery County, Maryland. Though the borders are not clearly defined, it contains the neighborhoods and commercial areas around Wisconsin Avenue. 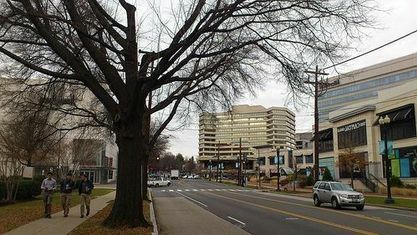 Often, many consider Friendship Heights as a part of Chevy Chase DC. The shopping plaza near the intersection of Wisconsin and Western provide the most substantial commercial aspects. The area contains a Bloomingdale’s department store as part of a larger redevelopment of the block. The new development, called Wisconsin Place, features residential and office space, in addition to a Whole Foods Market and boutiques. There are numerous department stores, boutiques, spas, a multiplex cinema, moderate and discount chains, and many other attractive services. Several corporate offices occupy the area such as the corporate headquarters of insurance giant GEICO, theRitz-Carlton hotel chain; as well as a concentrated amount of of broadcast media, including the studios ofWMAL, WMAL-FM, and WTTG (Fox 5). Friendship Heights consists roughly of the neighborhoods and commercial areas around Wisconsin Avenuenorth of Fessenden Street NW and Tenleytown to Somerset Terrace and Willard Avenue in Maryland, and from River Road in the west to Reno Road and 41st Street in the east. Within Maryland west of Wisconsin Avenue is the so-called “Village of Friendship Heights,” technically a special taxation district. Since the late 1990s, development within the neighborhood has accelerated the improvement of the area. Much credit can be given to the construction of Chase Tower on Willard Avenue. It is a new-and-improved Chevy Chase Center which replaced the 1980s-era complex. New Condominums were also build on the former site of the Washington Women’s Clinic. Get to know Friendship Heights better with our featured images and videos.